The majority of our genome is actively transcribed while only 2% of it encodes for proteins. This results in the generation of large numbers of so-called non-coding RNAs (ncRNAs). That these are transcriptional noise was quickly renounced when many essential, stable and cell-type specific ncRNAs were found in humans. While the biology of some of these ncRNAs is already fairly well established, as is the case for microRNAs, others are just being discovered and their roles are elusive. We investigate how piRNAs (Piwi-interacting RNAs) influence the regeneration of planarian flatworms by regulating mRNA turnover and by directing epigenetic changes in their stem cells. We examine how the oncogene CDK8 is regulated by other members of the Mediator kinase module and by ncRNAs. 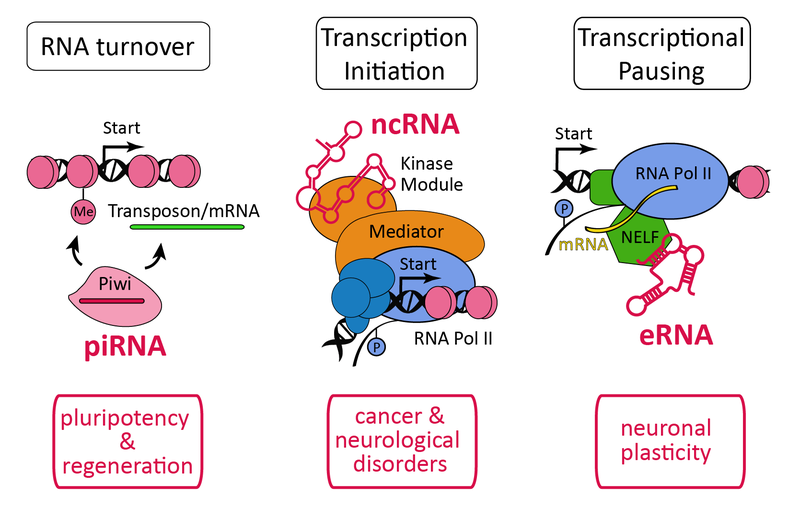 We study how eRNAs (enhancer RNAs) modulate promoter-proximal pausing of RNA polymerase II (Pol II) and thereby alter transcription rates in neurons. Graphical Summary of Current Research. The three classes of ncRNA under investigation are highlighted in red, the respective biological process that they are involved in is indicated on top. Major medical implications are listed below the cartoons that sketch their principal biological role. (Abbreviations: Me = histone H3K9me3, Start = transcription start site, GTF = general transcription factors, P = phosphorylation status of Pol II, NELF = negative elongation factor).